Dan Bradley describes his season with AFC Fylde as "probably the best spell of my career" and the club's latest signing can't wait to return to action with the Coasters. The midfielder, 29, played a major part in Fylde's National League North title glory of 2016-17 but left the club for Kidderminster Harriers that summer for family reasons. 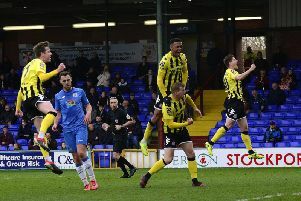 But he rejoined the Mill Farm club on a two-and-a-half-year deal on Tuesday and is raring to go ahead of Saturday's crunch home clash with promotion rivals Wrexham. Bradley said: "I snapped Chall’s hand off to come back. It hasn’t gone quite as I’d wanted back at Kidderminster and I had probably the best spell of my career here under Chall, so I kept in contact with him and spoke to him to see if I could get back. I’m buzzing to have signed. Explaining his previous departure from the club, he added: “I was panicking a little with my first child on the way and not knowing what was around the corner. "It was a case of the unknown and wanting to move closer to home, but now the dust has settled and we’re expecting our next child in April." But for now he is looking no further than Saturday's fifth v fourth clash to be followed seven days later with another top-of-the-table encounter at Solihull Moors. Bradley said: "When I found out the first thing was to look at the fixtures and there’s no better start than two massive games that could prove to be crucial. "Just after New Year’s Day I got a strain but I played 90 minutes on Saturday and am raring to go now. It was just a case of so many games over Christmas." AFC Fylde will visit Ramsbottom United in the third round of the FA Trophy on February 2. The Coasters were spared another long trek down south when the Greater Manchester club won Tuesday's replay at Weymouth 3-1. Ramsbottom are mid-table in Northern Premier League division one west.